This 2010 Nissan Altima 2.5 S has a Clean CARFAX. 23/32 City/Highway MPG. Here are some of the features: 2.5L 4-Cylinder SMPI DOHC CVT with Xtronic CVT with Xtronic, 16 Wheels w/Full-Wheel Bolt-On Covers, 6 Speakers, Air Conditioning, AM/FM radio, AM/FM/CD Radio, CD player, Power steering, Power windows, Remote keyless entry.At Tempe CJDR and Kia, we are committed to providing our customers with SAFE and RELIABLE vehicles at the RIGHT PRICE! All pre-owned vehicles are subject to an extensive 110 point inspection, and ALL reconditioning costs are already included in the price of the vehicle. NO HASSLE. NO GIMMICKS. LOW MILES! MANUAL! This 2015 Fiat 500 has a CARFAX One-Owner. Clean CARFAX. Odometer is 8071 miles below market average! 31/40 City/Highway MPG. 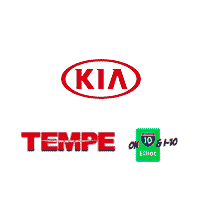 Here are some of the features: 1.4L I4 16V MultiAir 5 Speed C514 Manual 6 Speakers, AM/FM CD MP3 Radio, AM/FM radio, CD player, Cloth Bucket Seats, Power steering, Power windows, Remote keyless entry, Steering wheel mounted audio controls.At Tempe CJDR and Kia, we are committed to providing our customers with SAFE and RELIABLE vehicles at the RIGHT PRICE! All pre-owned vehicles are subject to an extensive 110 point inspection, and ALL reconditioning costs are already included in the price of the vehicle. NO HASSLE. NO GIMMICKS.